PEM 500 Series Directional Swivel Unions are used to align those jets and nozzles, that do not have a swivel base incorporated and require directional adjustment beyond 5o to maximum 15o off center line. For lesser directional adjustment use PEM 08 Series Adjustment Flanges. 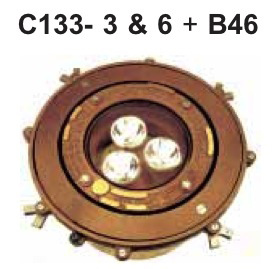 PEM 531 - 535 are made of brass, PEM 536 - 541 are made of brass and bronze, while all larger ones are made of cast bronze. All bolts are of stainless steel.